This week marks the launch of the African Continental Free Trade Agreement (CFTA), which sets out to create a single market for goods and services, free movement of people, and expand intra-Africa trade. In addition to promoting intra-Africa trade, the CFTA has the potential to promote regional value chains. In this post, we explore the lessons learned from highly integrated global trade and production networks. Current interlinkages between African economies are insufficient to accelerate economic growth among regional economic communities including the Common Market for Eastern and Southern Africa (COMESA), East African Community (EAC), and Southern African Development Community (SADC). Extra-regional trade has historically outpaced intra-regional trade, often by 90 percent. Similarly, Africa lags behind much of the world in intra-regional integration. As seen in Table 1 below, the share of trade with countries within regional economic communities in Africa lies well below that of regional economic communities in Europe or Asia. Nevertheless, there exists variations in relation to trade integration across African countries. At the low end of the spectrum stands the Economic Community of Central African States (ECCAS), which only sourced 3.6 percent of imports from within. At the high end of the spectrum lies the Southern African Development Community, with 21 percent of exports and 22 percent of imports exchanged within the regional economic community. The European Union is especially prone to GVC integration as it subsumes many relatively small countries, such as Belgium and Luxembourg, which heavily rely on GVCs to source their inputs. Eastern European countries often serve as the “factory” to multinational companies in Western Europe. This is referred to as nearshoring—as opposed to far-shoring, which refers to the outsourcing of production to countries further away, i.e., those in Asia or Africa. Within the EU, there are differences in integration. The European Competitiveness Report finds that the EU12 (Bulgaria, Czech Republic, Estonia, Cyprus, Latvia, Lithuania, Hungary, Malta, Poland, Romania, Slovenia, and Slovakia) are more vertically integrated than the EU15 (Austria, Belgium, Denmark, Finland, France, Germany, Greece, Ireland, Italy, Luxembourg, Netherlands, Portugal, Spain, Sweden, and the United Kingdom). The EU12 have historically been the providers of intermediate goods to EU15 countries. Transactions between Western and Eastern European countries are characterized by production sharing agreements, reflecting the traditional U.S. and Mexico model, i.e., come and go transactions. Nevertheless, according to the 2012 European Competitiveness Report in recent years, far-shoring has gained attractiveness while nearshoring has decreased. This can be attributed to lower wages, increased connectivity, and improved logistics, among other factors. Notably, China is becoming an increasingly attractive host for the production arm of Western European countries’ multinational corporations. China is also near and far-shoring. Some Chinese companies are shifting production toward neighboring Asian countries, whereas China’s far-shoring destinations include Ethiopia and other East African countries. In addition to a divided production chain—where one side provides intermediate goods and labor and the other provides expertise and final goods—the gains from GVCs have been distributed unevenly; 55 percent of the value added generated within GVCs is concentrated in 21 countries (The U.S., Japan, South Korea, Taiwan, Australia, Canada, and the 15 pre-2004 members of the EU). As countries become increasingly integrated in global value chain processes, certain countries reap the benefits of increased integration, while others suffer detrimental consequences on jobs and wages. This paradox often referred to as the winners and losers of GVC debate is different in developed countries compared to developing countries. In developed countries, the issue is around the loss of low-skilled jobs. Though this is often compensated by the burgeoning of new high skilled jobs. In OECD countries, Germany, Korea, and Poland have seized the benefits presented by GVCs by increasing their participation in GVCs and transforming that participation into productivity growth. They have been able to do so by adapting the skillset of their labor force to the demands of GVCs. They also increased their technological specialization in advanced industries. The OECD report attributes the inability of certain countries to reap the benefits from increased GVC integration to insufficient skills. Skills development is thus deemed vital in reducing the need for offshoring and giving workers the skills to face globalization. European governments have responded to decreased employment with a wave of labor market reforms and investment toward returning estranged workers to the labor force. While some of the buffers put in place by European governments are entirely mollifying—e.g., unemployment insurance—other reforms have been criticized as being protectionist—e.g., subsidies, quotas, and non-tariff barriers. While social safety nets were not implemented to explicitly serve as a remedy to the loss of jobs created by increased global value chain integration, they have been able to mitigate the negative effect of outsourcing on employment. As seen in Europe, within a regional trade group there can be stark differences in GVC integration; Africa is no different. The continent’s participation in GVCs is heavily driven by Northern and Southern Africa, making up 78 percent of the continent’s total value chain trade. This is attributed to the presence of natural resources and export specialization in mining activity. However, one key difference is that African countries are structured differently, and the room for cross-African GVCs is limited. While the EU is made of both “headquarter” and “factory” economies, Africa is mainly comprised of “factory” economies. As seen in the Figure 1, in 2016 a large share of Africa’s exports of intermediary electronic, vehicles, and apparel products were shipped to Europe, North America, and East Asia. When involved in GVCs African countries tend to serve as the “factory countries” to Europe, North America, and Asia. 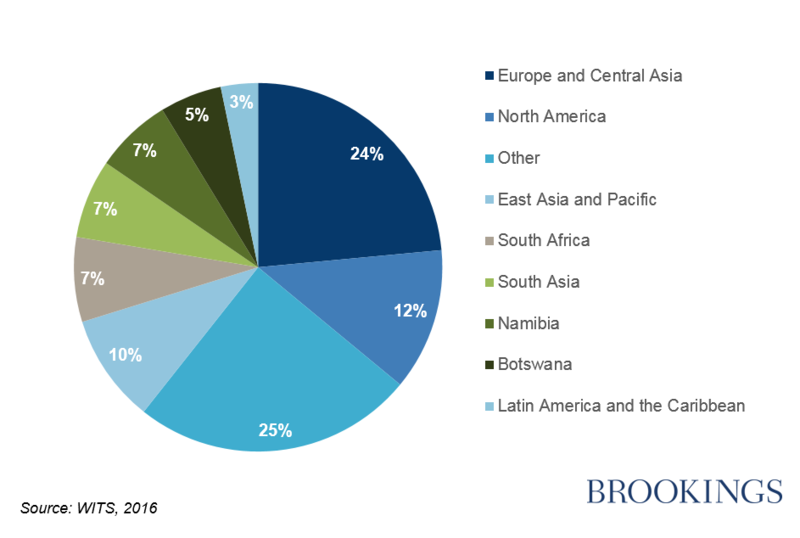 The few African countries that serve as a destination of intermediary products for their fellow African countries include South Africa, Namibia, and Botswana. As highlighted earlier, Southern Africa has a higher share of intra-regional trade than other African sub-regions. Africa’s GVC integration shares another similarity with Europe in that gains from value chain participation vary significantly between countries. While there exist employment growth opportunities through GVCs, it has been difficult for African countries to increase employment through participation in GVCs alone. As seen in certain European countries, GVCs have brought declines in employment in some African countries. For instance, the South African textile industry has deteriorated as the country’s apparel companies have outsourced to countries such as Lesotho, which has comparatively lower wages. Furthermore, social gains from increased GVC participation have been limited by factors like skills deficits, increasing informal employment, and unequal power relationships within value chains. As member countries prepare an African CFTA implementation roadmap and national strategies, policymakers should consider the following questions: Would the CFTA lead to “headquarter” and “factory” economies? Who would be the likely winners and losers? How would distributional impacts of trade and integration be addressed? And what social safety nets and skills policies need to be in place to manage the winners and losers situation?